Thomas Paine was born on February 9, 1737 in Thetford, a town in Norfolk, England. His parents were Joseph and Frances Pain. From 1744 to 1749, Paine attended the Thetford Grammar School. Around the time he was 12 or 13, he took on a 7-year apprenticeship working for his father making stays for corsets. He became a master stay-maker and opened his own shop in Sandwich, Kent. On September 27, 1759, he married Mary Lambert. Mary became pregnant, went into labor and both she and the baby died. During the next few years, he went from job to job, working as an excise officer, stay-maker, servant and minister. On February 19, 1768, he was hired as a schoolteacher in Lewes, East Sussex. He was introduced to the intellectual group Society of Twelve by Samuel Ollive. Ollive owned the Bull House, which was the tobacco shop that Paine was living above at the time. On March 6, 1771, Paine married Samuel’s daughter, Elizabeth. In 1772, Paine published the 21-page pamphlet The Case of the Officers of Excise, which petitioned Parliament for better pay and working conditions for excise officers. On April 14 he sold his possessions to pay his debts and avoid debtor’s prison. On June 4 he separated from his wife and moved to London. Then, in September, he was introduced by a friend to Benjamin Franklin. Franklin suggested he should go to America and provided him with a letter of recommendation. Paine left for the Colonies in October and arrived in Philadelphia on November 30, 1774. On January 10, 1776, he published the 47-page pamphlet, Common Sense, which urged Americans to declare their independence and to replace the monarchy with a republic. Paine believed that democracy is the only form of government that can guarantee the natural rights of man. Common Sense was an immediate success, selling 120,000 copies in the first three months, and three times that over the next three years. Later that same year, John Adams published Thoughts on Government in response to Common Sense. 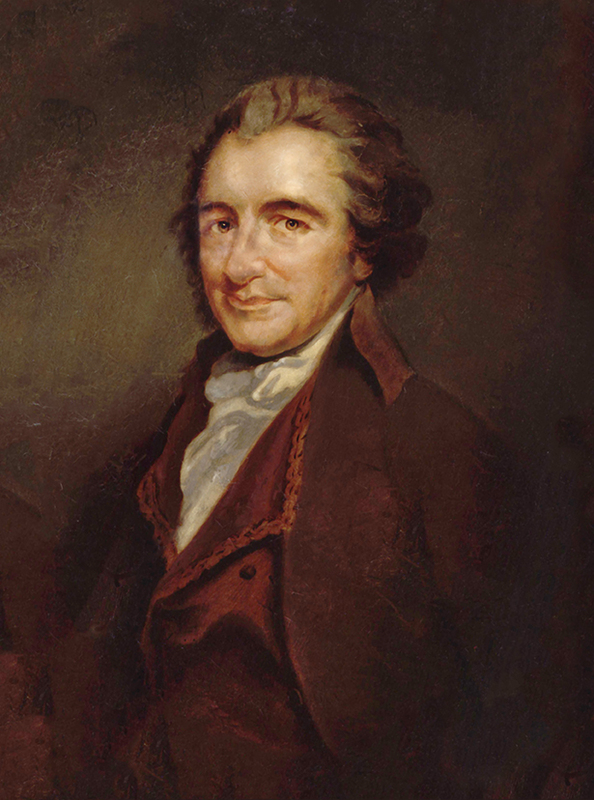 Adams called Paine’s work a “crapulous mess” and disagreed with Paine on many points. Thoughts on Government advocated a more conservative approach to republicanism. In December 1776, he began publishing his series of pamphlets called The American Crisis. The first of these pamphlets begins with the line, “These are the times that try men’s souls.” Working as a clerk for the Pennsylvania Assembly in 1780, he wrote the preamble to the first bill emancipating slaves by an American legislature. After the war, Paine worked as a civil engineer and designed an iron bridge. In 1787, he went to Europe to obtain the endorsement of his bridge from the scientific community. From 1787 to 1790 he traveled between England and France. In 1791, he published the first part of the Rights of Man in response to Edmund Burke’s criticism of the French Revolution. Paine’s hope was that Rights of Man would be a British version of Common Sense. He published the second part in February 1792, and by 1793 more than 200,000 copies had been sold. Because Rights of Manencourage the people to overthrow the British monarchy, he was tried and convicted for treason in December 1792. In the National Convention, he aligned himself with the moderate Gironde group, but when the Jacobins seized power they revoked his citizenship. He was imprisoned from December 1793 until September 1794. During this time, he wrote the first part of the Age of Reason, which presented his thoughts on deism and renounced organized religious, especially Christianity. Paine was freed in 1794 due to the efforts of James Monroe, the U.S. Minister to France. In 1796, Paine published the second part of Age of Reason, but he also wrote a letter to George Washington that attacked his fellow Founding Fathers and was highly critical of Washington’s dealings with France. When Paine returned to America in 1802, it was to a cool reception. Paine died on June 8, 1809 at the age of 72 in Greenwich Village in New York City. The building that stands at 59 Grove Street today bears a plaque noting that it is on the site of the place where Paine died. His obituary in the New York Citizen included, “He had lived long, did some good and much harm.”Paine was originally buried in New Rochelle, New York, but his bones were dug up by William Corbett. Corbett took the bones back to England where he planned to give them a heroic reburial, but that never happened. The bones of Thomas Paine were in Cobbett’s possessions when he died.